 In the six seasons of Xena: Warrior Princess, we have seen Xena and Gabrielle travel over much of the known world. Apparently, they learn the local languages easily. They have spoken with the people of Ch'in, Britannia, North Africa, Egypt, India and the Norse lands, to name only a few, with great ease. Both are literate. Gabrielle is famous for her scrolls, but we have also seen Xena reading Lao Ma's book and Cleopatra's hieroglyphics (though more likely the historical Cleopatra would have written in Greek), and Ares presented documents with laws she could enact (THE RECKONING). Xena has herself written notes for Gabrielle on at least two occasions (PARADISE FOUND and THE RHEINGOLD). We know this from Gabrielle's scrolls. We might ask what language she used in writing them, but the answer is obvious. As traveled as they are, Xena and Gabrielle consider themselves Greek. They probably speak Greek with each other and it is improbable that Gabrielle would use any other language for her records of their adventures. Time is a flexible concept in the hands of Renaissance Pictures, but in the early days of the show, we were told that Xena and Gabrielle were Mycenaean or pre-Mycenaean. This, very roughly, is the period of the Homeric epics, five to eight hundred years before Homer himself. It is also hundreds of years before the advent of the Greek alphabet. Two centuries ago, it was understood by the educated that the Homeric tales were no more than fantasy, but fantasy of incredible art, of course. While even the classical Greeks were taken by the history of Egypt, it was manifest before their eyes. There was no documentation of a pre-classical Greece. The lesser educated were not so sure. Heinrich Schliemann, a businessperson during the period of the Crimean war made wealthy by his enterprise, and a would-be archaeologist, set out to find Troy and Mycenae. By 1876, he had succeeded spectacularly, beyond his knowing. What he took to be the ruins of the age of the Trojan War were in fact a thousand years older. By modern standards - indeed, even those of only thirty years later - Schliemann's methods were crude. However, it is inescapably true that he put pre-classical Greek archaeology on the map. A page-shaped tablet bearing Linear A. One of the most notable names in Greek archaeology since Schliemann is that of Sir Arthur Evans. Evans distinguished three types of writing at his digs on the mainland and on Crete. 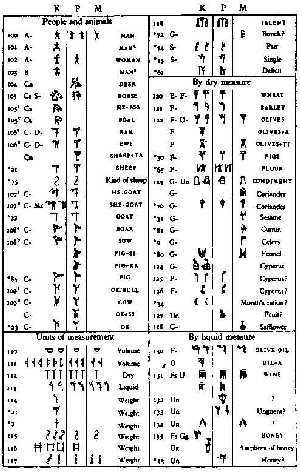 In order of use, he called them Hieroglyphic, Linear A, and Linear B. Evans used the word hieroglyphic because of some superficial resemblance the script had to the Egyptian variety. None of the scripts were alphabetic, none could be read, and not even the language they represented could be determined. However, some things Evans could see. Linear B, for example, was always written left-to-right and had three character sets in use. One was numeral, one was a set of ideographs (which Evans thought probably represented commodities), and the third was a syllabic script. Linear A has a similar structure. Modern readers are familiar with two types of scripts that are broadly termed alphabetic and ideographic. In the first, each character ideally represents one sound, and in the latter, an idea. There is another type, syllabic, in which the characters represent syllables. The example probably most commonly seen now is the Devanagri script used for Sanskrit. Even when nothing else is known about them, the number of symbols in use can distinguish each of these basic types of script. An alphabetic script typically has twenty or thirty elements. An ideographic has thousands and a syllabic uses about one hundred. 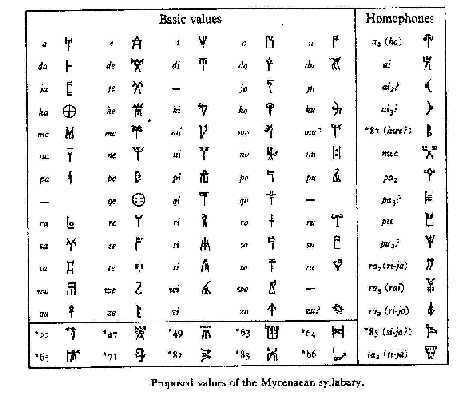 A proposed syllabary for Linear B. 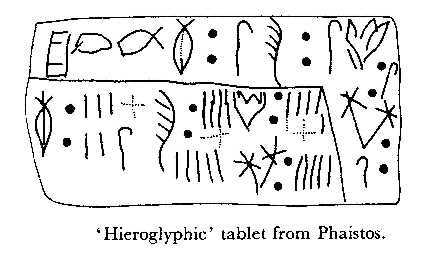 All the Linear B texts Evans found were on clay tablets, in two forms: leaf and page shaped. These tablets were unearthed at royal seats (palaces) and were baked when the palaces were destroyed by fire. The only clue he had for the language was a negative one: Since his finds indicated to him that culture had flowed from Crete to the mainland, Greek was out of the question. Evans was adamant regarding his privilege of first publications of his finds, but he was very slow to actually publish the tablets (considering other matters more important). By the time of his death (1941), Evans had publicized the text of fewer than one hundred fifty tablets, though it was known that he had over three thousand pieces. Another archaeologist, Sundwall, had published thirty-eight more, earning him Evans' ire. Evans' younger associate, J. L. Myers, made the rest public. The small number of samples of Linear B known to the wider world during Evans's life made decipherment impossible, though there were attempts. Both amateurs and professionals tried and failed. One professional, Alice Kober, showed that the language - whatever it may be - had to be inflected (the endings of words changed to indicate grammatical changes). Sadly, she died in 1950, at the age of 43, before she got any farther. In 1936, Michael Ventris heard a lecture by Evans on his Minoan (Cretan) work. This sparked Ventris' interest in the Linear B script and he began working to decipher it. Like any other serious worker (and though Ventris was an amateur, his methods of decipherment were rigorous), Ventris accepted Evans' pronouncement as to the impossibility of Greek as the language of Linear B. In the process of trying various hypotheses (generally to show them false), Ventris eventually applied Greek to Linear B. To his amazement, it seemed to fit, though yielding a result odd by classical Greek standards. 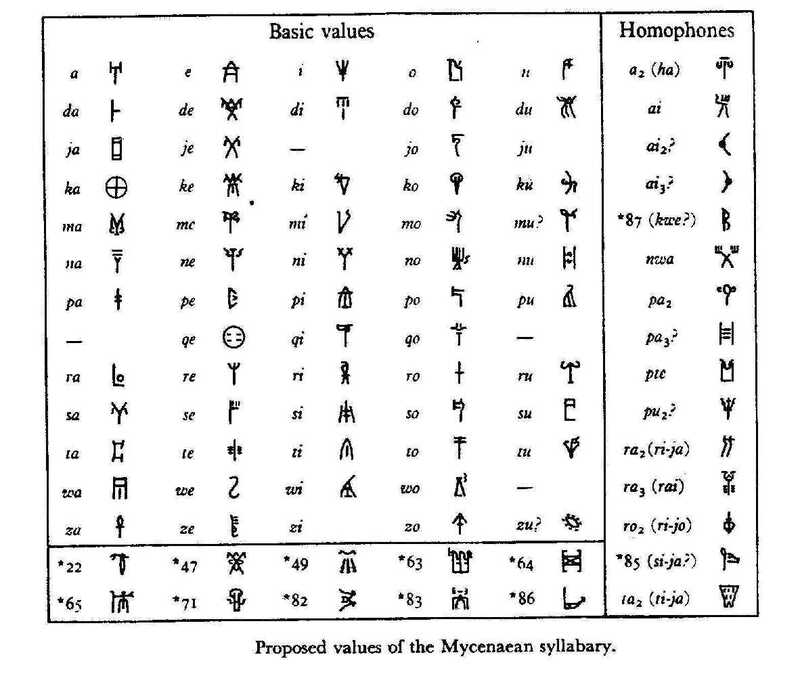 He asked John Chadwick of Cambridge University for help and by 1952, they were able to show clearly that Linear B did indeed record Greek, a Greek much older than Homer, though reflected in some of Homer's vocabulary. 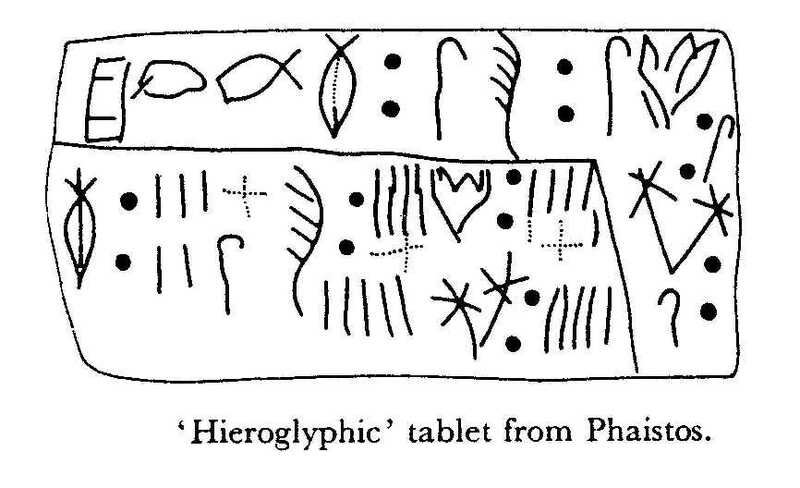 Tablets were even then still being found and some were read (e.g., by Blegen) before being published, with the aid of the work of Ventris and Chadwick. Unusual for the field, most archaeologists soon accepted the result. This was fortunate. In a turn truly operatic, Ventris was killed in an automobile accident in 1956, still young (34) but he had lived long enough to see the triumph of his work. Note that the column headers indicate the source of finds: K is Knossos, P is Pylos, and M is Mycenae. 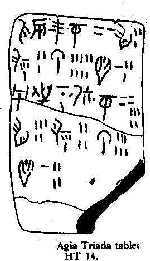 Of the scripts Evans found, only Linear B is generally recognized as being deciphered. The Hieroglyphic is entirely unread, but Linear A shares a similar connection with Linear B that Etruscan does with Latin: In both cases, the pairs share many symbols. For both Linear A and Etruscan, if we take similar (to Linear B and Latin, respectively) symbols to represent similar sounds, then we can pronounce the languages after a fashion. However, the sounds are meaningless. In both cases, the reason is the same: insufficient examples exist to provide enough starting material for decipherment. Evans gave the Linear scripts that name because, though they are written on clay, they are not cuneiform. Cuneiform, some of which is much older still than Linear B, is so termed because it is written with impressions of the end of a stylus. No lines per se are made. It is easier to write on clay in this way than to draw lines. This is one of several odd points about Linear B. Another is that the tablets are found only at burnt ruins. Dates can be read from some tablets, but those are rarely more specific than "this year" or "last year". The text of Linear B tablets is the clue to answering some of these observations. They are all accounts, none being narratives. No prose has been found in Linear B, though one could hope to have Homeric source material if literature ever was found. Evans was right. The ideographs are indeed the commodities being tallied. The scribes had a filing system too, baskets of tablets. Some of these have been found still tagged with labels of their contents. Because of the nature of the tablets, there are very few complete sentences. 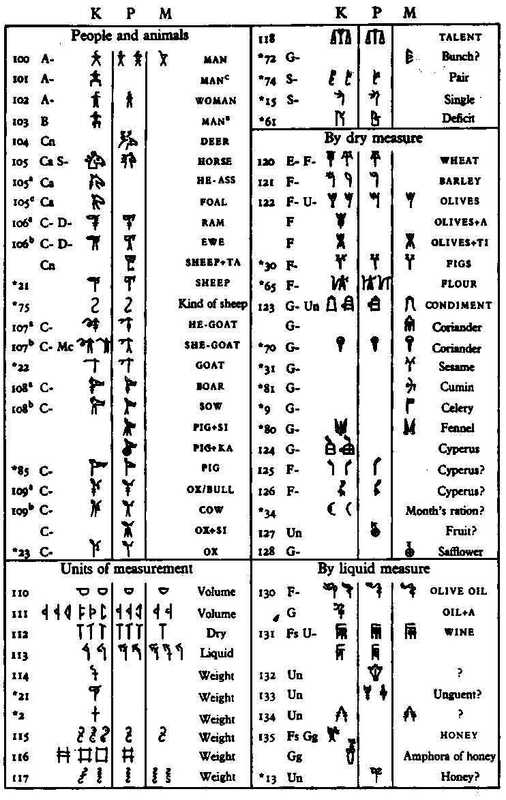 Over half the words written in the syllabary of Linear B are proper names, for example of the owners of the materials listed, of workers, or of slaves (and even of oxen). These names are frequently non-Greek. This lack of prose Mycenaean Greek makes reconstruction of the language difficult. That the tablets are found only in ruins and that they are written in a linear script are probably both due to one thing: The tablets were a temporary record only. At some convenient interval, say every year, the records were transcribed to some other medium and the tablets pulped to make new. Whatever this other medium was, it seems lost to us. It was probably something perishable, such as papyrus or parchment. Due to a climate more destructive than that of Egypt, these would not last long in Greece. However, we can say one thing, this medium would have been the reason for the form of the script. Linear strokes would be more natural for writing on such materials. The Devanagri script is well suited to writing Sanskrit. Like Linear B, Devanagri symbols represent either pure vowels or "open" syllables. These are a consonant followed by a vowel. Sanskrit is composed largely of words made up from such syllables. However, Greek is not. As an example, consider one of the place-names listed in the tablets and a place where tablets have been found: Knossos. The "Kn" cannot be represented in Linear B, nor can the "ss" or the final "s", since it lacks a following vowel. This means that rules for interpolating words from what can be written, and vice-versa, must exist. Knossos is found written as "ko-no-so". As an exercise in interpretation, reading Greek in Linear B is even more taxing than reading English phonetically in the Roman alphabet. 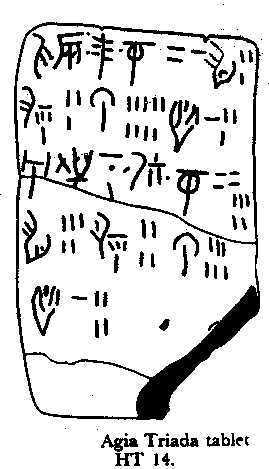 A leaf-shaped Linear B tablet. The antiquity of Linear B preserves one of the oldest recorded Indo-European languages. Others are Hittite, Old Persian, and Sanskrit. Linear A is almost certainly not Greek, leaving details of the origins of the script a bit of a puzzle, given that it is quite likely that Linear B descended from Linear A, which may itself had its origins in the Hieroglyphic. So, if Gabrielle were writing before Homer, she would probably have used Linear B. None of the non-English writing seen on the program is in fact Linear B, nor likely anything else, either, save only the modern Greek scene titles in A DAY IN THE LIFE. It is impossible to believe that even people as ancient as the Mycenaean Greeks had no story-telling arts. Homer could not have sprung up sui generis. However, the difficulty of reading must give us pause when we try to imagine a pre-Homeric author writing in Linear B. The author wishes to acknowledge use of material found in Ventris and Chadwick (see Bibliography, below). Reprinted with the permission of Cambridge University Press. Ventris, M. and Chadwick, J. Documents in Mycenaean Greek, second edition. Cambridge University Press (1973). Strictly speaking, only Chadwick is the author of the second edition. This is the anchor of Linear B studies. It has since become somewhat dated, but newer material tends to reside in scholarly journals, many not in English. The first few chapters give a readable account of the discovery and decipherment of Linear B.
Chadwick, J. The Decipherment of Linear B. Cambridge University Press (under the Canto imprint) (1958). This is a 157-page paperback (plus an appendix and index) less erudite than Documents but still meant for a specialized audience. Chadwick, J. Linear B and Related Scripts, Volume 1 in the series "Reading the Past". University of California Press (1987). This is a slim paperback (64 pages, including index) aimed at the public. For an example of the structure of Sanskrit, have a look at the libretto for Philip Glass's opera Satyagraha. Play the recording, too - the language is wonderfully melodious. First episode seen: THE QUEST in rerun in the winter of 1997-98. I was learning about the show rapidly enough (mainly courtesy of Tom Simpson's site) that I knew within a week of the significance of "the kiss". First new episode I saw was WARRIOR...PRIESTESS...TRAMP, so I got introduced to the variety of styles right away.